As a native of Atlanta, I can tell you our restaurant scene is nothing like it was when I was growing up when the height of sophistication and fine dining was a dinner at Coach & Six. (I still miss those spinach rolls.) We had our share of cafeterias and fried chicken places, but Swiss cheese on a sandwich was about as international as we got. Now our food scene is thriving and the problem is how to choose from our thousands of amazing restaurants. Here is a selection of some of Atlanta’s best restaurants from Buckhead to The Battery, from the truly cheap (food truck park and the best shrimp chowder!) to classics that have stood the test of time. A lot of our city’s newest restaurants have opened around our new Braves stadium, which was relocated from downtown to SunTrust Park. Unlike the previous location at Turner Field where there was literally no retail or restaurants within walking distance, The Battery surrounding SunTrust Park is filled with fantastic restaurants and shops. It’s worth a trip any day of the week, and not just on game day. Achie’s Celeb chef Hugh Acheson opened this restaurant in the bottom floor of the Omni Hotel where it serves breakfast, lunch and dinner. He named it after his grandfather, Archibald Acheson. Antico Pizza has been serving wood-fired Neapolitan pizzas for years from its original location and has become a celebrity favorite. C. Ellets Steak House is from famed chef Linton Hopkins. Look for porterhouses for two to cost more than $100 here. If you’re looking to impress a client, this is your choice. El Felix is from Ford Fry, one of my favorite restaurateurs who just always hits it out of the park with every one of his restaurants. (C’mon, I had to have at least one baseball reference. He is even more amazing when you consider how many different cuisines he serves. El Felix serves Tex Mex classics like tacos, fajitas and enchiladas. There are plenty of restaurants in The Battery at SunTrust Park. 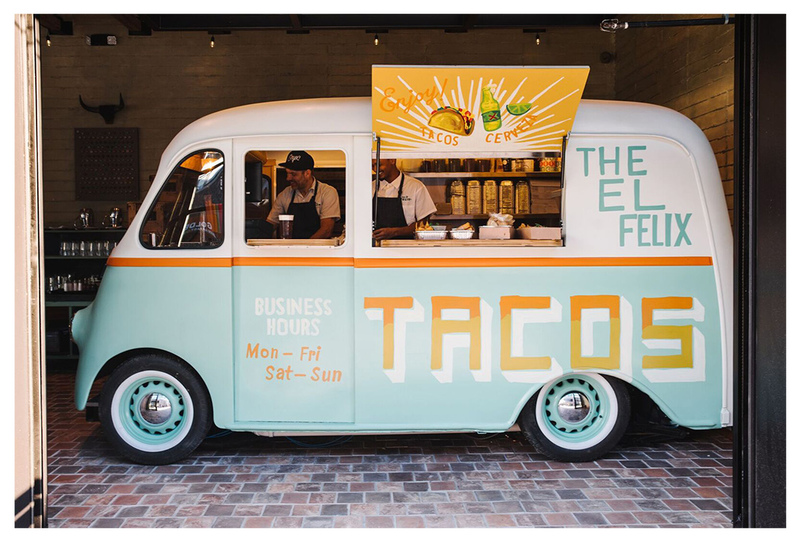 But if time is tight, opt for a taco from this adorable El Felix taco truck. Feed Fried Chicken We fell in love with this place at first sight. The simple menu includes chicken selections with your choice of heat level: Southern fried – no heat; Atlanta hot – medium and Cluck’n inferno – very hot. Sides include crinkle fries, Texas toast and all-day braised greens. Punch Bowl Social Part of a national chain, Punch Bowl Social has food, drink, karaoke and games that include pool, pinball and bowling. Terrapin Station We ate here on our first trip to SunTrust Park, opting for a table outside where we could watch the crowds wandering around The Battery. While my husband and his brother may initially have been attracted by the beer selection, we all loved the Fox Bros. Bar-B-Q the restaurant serves. When we were done, we had our our entrance to the ballpark from the back door. How easy is that? Wahlburgers Sometimes you just gotta have a burger. But if you’re buddies aren’t into beef, they can order haddock, chicken or vegetarian offerings at Wahlburgers. It’s nothing to look at, the location is out of the way and the décor is more blue plate special than Blue Ridge Grill. But the food? That and the amazing value are what make Hankook Taqueria one of my favorite Atlanta restaurants. Located in Westside Atlanta, Hankook is the creation of Tomas Lee, formerly with Buckhead Diner and Corner Cafe so he knows his way around the kitchen. I alternate between one and two tacos at Hankook. When I’m being really naughty, I go for the highly addicting sesame fries. The menu is blessedly short (for indecisive people like me) with your choice of a few different types of Korean BBQ tacos: chicken, beef, pork, fish and tofu. They all come with lettuce, green onion, green cabbage tossed in soy sesame vinaigrette, yellow onion, cilantro and lime juice. At starting at just $2.75 each you’ll be tempted to order several tacos, but I’ve found them so large that’s it’s pushing it for me to eat two. And you’ll want to save room for a few tastes of the Street Snacks, like the fried dumplings, tempura fried Korean sweet potatoes or the incredible sesame fries. Hankook also serves burritos and quesadillas and features a few specials each day. You order at the counter from some very friendly ladies and take a seat wherever you like on the diner-style tables covered with kitchen-motif tablecloths that may look familiar to any “I Love Lucy” fans. And if you notice a large orange-and-blue food truck with Yumbii on the side, follow it and get your Hankook tacos there as well. Tomas has partnered with Carson Young, who runs the truck. Check on its next location by checking out the website or following it on Twitter at @yumbii. However you do it, get yours hands on the some Hankook. My husband and I have enjoyed watching our neighborhood turn into a trendy one for dining. Thanks to the pioneers at Bacchanalia who in 1999 stunned people by moving from Buckhead to a converted meat-packing plant in the not-yet-named area now known as Westside, many other restaurants followed suit. Since then we’ve seen the addition of Tacqueria del Sol, West Egg Café, Ormsby’s, Bocado, Miller Union, Figo and JCT Kitchen, just to name a few. But one thing we’ve been missing. Good barbecue. But then Red’s moved in. 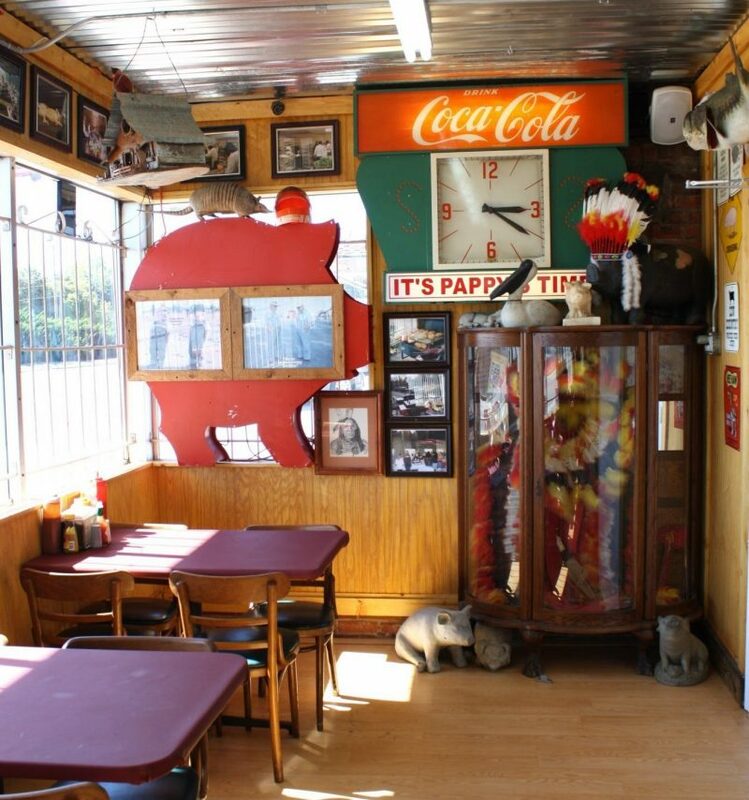 It took over a nasty old building on Chattahoochee Avenue and renovated it into what a good ‘cue place should look like, with wood piled up front, cut-out pig on the roof and a mish-mash of decorations on the interior with a particular focus on airplanes and cowboy regalia. Now it’s been my experience with barbecue restaurants – and I have a LOT of experience all over the country – that a few dishes may be really good, but something else just ain’t that great. And usually it’s the Brunswick stew. It is very hard to find a decent Brunswick stew. They are often too watery, too spicy or lack any flavor. Well Red’s tastes just like the one I make and love, so my Crockpot may get a rest for a while. The pulled pork is piled high and the ribs are tender and tasty. There is always more than plenty for both of us. My husband has a man-size appetite so the fact we have leftovers gives you some idea of the portion sizes. The fried okra and collard greens are very good as well. If you’re not a cue fan you can opt for a vegetable plate, which of course could include mac and cheese, as it is considered a vegetable below the Mason-Dixon line. Other barbecue dinners include pulled chicken and beef brisket. All their meats are cooked over hickory wood and are available in bulk as well. When he’s being really naughty, my husband will go for Miss Gracie’s blackberry cobbler for dessert. Whoever says women aren’t hunter/gatherers didn’t see me in tracking mode at Flip. My prey? Another bite of those awesome vodka-battered fried rings with beer honey mustard. I’d just completed a helping of the equally delicious French fries. These spectacular spuds are elegantly served in a small glass, forever dispelling the finger versus fork issue. They are perfectly lined up for ease in plucking out with your thumb and forefinger. Meanwhile my husband was angling for the beets with goat cheese and licorice, as we are an anti-beet household at my direction. 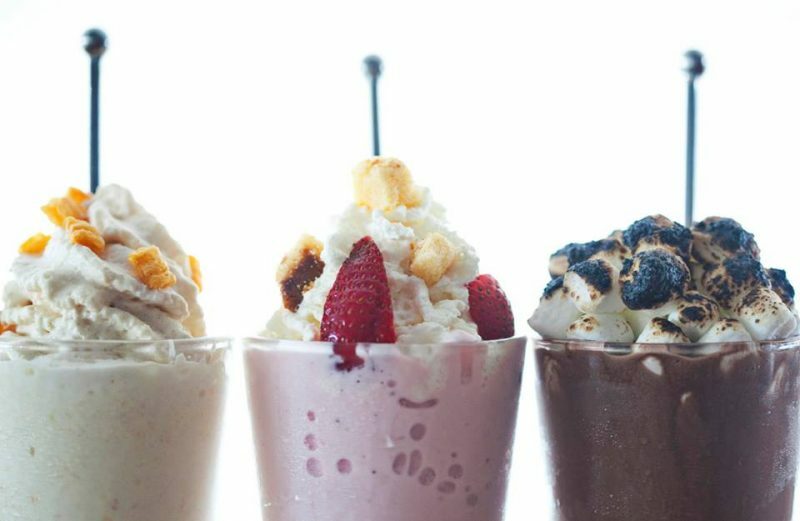 The milkshakes at Flip go beyond the ordinary. 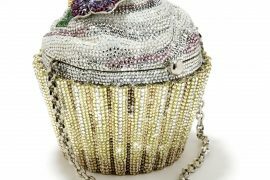 Why just do when you can overdo? Although I’m fairly certain I saw a Costco-sized jar of the nasty little red things hiding above the dryer, but for the sake of marital harmony, am ignoring it. We were tasting several items and one of my favorite items was the BBQ, their version of a barbecue burger with coleslaw and smoked mayo. If you’ve been to Flip then you’re familiar with the drill – smaller sized burgers packed with great big taste. Each burger is made with brisket, short rib and hanger steak. One burger is the perfect size for me, especially when accompanied by one of their side dishes, which also include fried pickles, tuna tartare tacos and bacon cheese macaroni just to name a few. You can take the heathy route and try a chicken grain bowl. On the flip side (sorry, couldn’t resist) the milkshakes are amazing. You can opt for vanilla or go wild with Nutella + Burnt Marshmallow, Cap’n Crunch or Krispy Kreme. 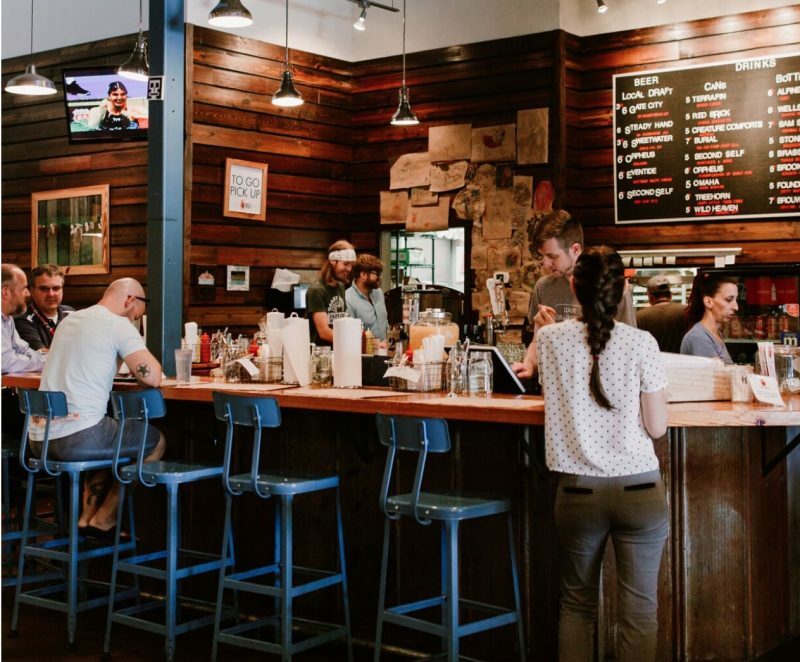 Flip in located on busy Howell Mill Road with well-lit but still cozy booths along the sides and a great patio.Prices are very reasonable here – you can get an order of fries and a burger for around $12. I love everything about Farm Burger, from their juicy grassfed burgers to their plethora of toppings to their farm-inspired-but-not-cheesy decor and serving pieces. Guests wait in line, which I appreciate because it takes me a while to decide what I want. Snacks include kale salad and get this, sweet potato hush puppies with apple butter. As my dear mother-in-law was fond of saying, “Why, I never heard of such a thing.” Now you have and you’ll want to order this little goodness bombs. Farmburger has four locations in Atlanta. Be sure to get the sweet potato hush puppies. There are a few choices of burgers, all made with grassfed beef (free from antibiotics and hormones) with various toppings or you can build your own. You can opt for the pasture-raised pork burger. Other choices include hot dogs and a variety of fries including pimento cheese fries. Again, have you ever heard of such a thing? This place takes its goal seriously, which is “to connect soil, animal, plant, rancher, butcher, chef & you…all in a simple wire basket.” How many restaurant websites include photos of their farms and information on their butcher? Another thing I love about Farm Burger is that the restaurant offers ethically produced food affordably. So while you may feel guilty about the calories here if you indulge in a fried potato option, you don’t have to feel bad about the price. We can actually walk to Watershed from our house if we’re feeling energetic. We love the food and it’s where I had one of my few celebrity sightings in Atlanta, which is awash with A-listers since Georgia became a mecca for movie filming. We went there with several friends a few years ago. After we’d been seated for a while my friend Susan whispered to me, “Colin Firth is over there. And we had a moment.” I still laugh about that moment and am happy for her and her Colin Firth Moment. There may have been a few roundabout trips to the bathroom hoping for a moment of m own. But back to the food. 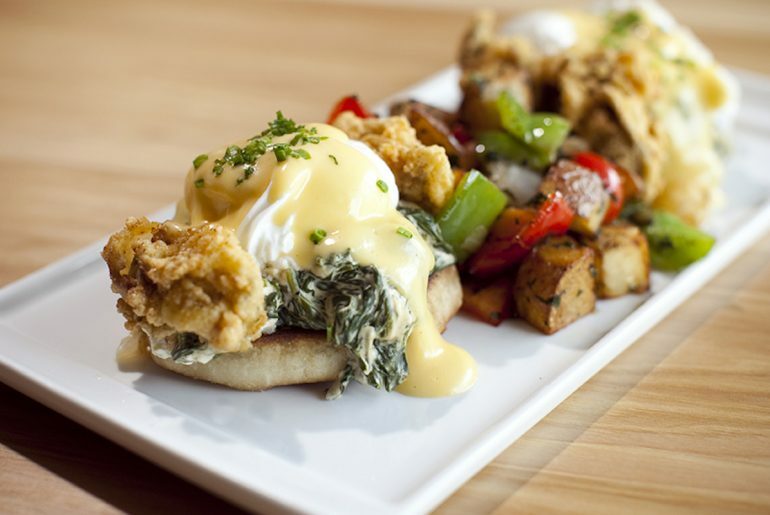 Watershed serves lunch, dinner and Sunday Jazz Brunch, with local southern dishes. Think deviled eggs, pimento cheese, roasted oysters, chicken and dumplings and pecan crusted flounder. 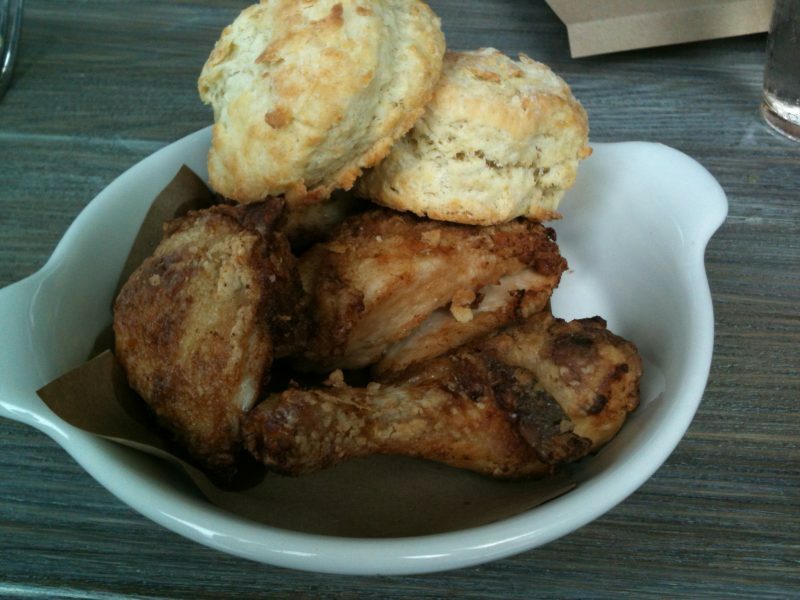 You have to get to Watershed early on Wednesday nights to get the delicious fried chicken. It tastes just like the chicken my momma used to make. Wednesday is for fried chicken, served lunch and dinner. I found out why their version is so popular. Their chicken tastes exactly like what my mom used to make, so I know it was cooked in a well-loved skillet. I took one bite and was flooded with memories of my mom’s delicious fried chicken. She always made a huge batch to take with us when we went on vacation. On our way to the beach or my grandparents house we’d start scouting acceptable rest stops where she’d carefully lay out piles of delicious cold fried chicken, deviled eggs and white bread with butter while my brothers and I eagerly waited to get our hands on the drumstick. My beloved mother passed away in 1995. I inherited the cast iron skillet she cooked all those delicious pieces of chicken in but never perfected her skill with it. Now I know I can go to Watershed when I need a taste of home. 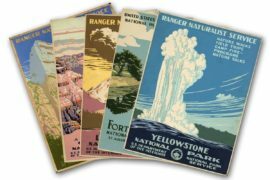 And I may just need to get a box to go for our next road trip. “I was going to put this burger in my top five,” my son said when we visited Smashburger the first time. “But I can’t think of one I’ve liked better.” That was high praise indeed from a college student, whose study of all forms of pizza and burgers was practically part of his engineering curriculum. My husband and I loved Smashburger too, whose first location in Atlanta was in Buckhead at Buckhead Crossing Shopping Center. 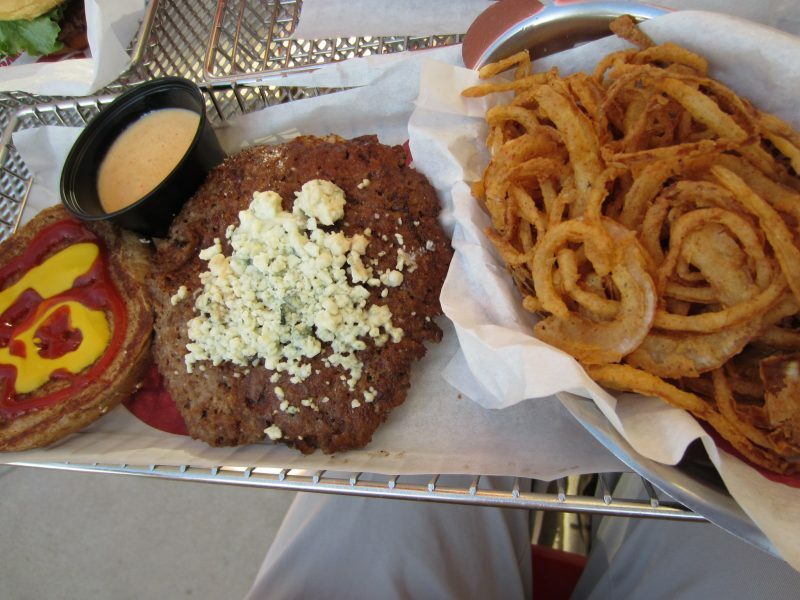 Here are the top five reasons we loved Smashburger. Keep in mind that I was eating dinner with two muscular men and my son has the enviable metabolism of a hummingbird. I can put it away pretty well but in the interest of my waistline and painfully slow metabolism, have to moderate myself. So while I could order a smaller size (Smash), they could go all out for the bigger one (Big Smash.) You also can pick the Small Smash for any burger for $1.00 less. We had four side dishes: the French fries, sweet potato smashfries, haystack onions and small wedge salad. Our favorite was the thinly sliced haystack onions, perfectly cooked. I also loved my sweet potato smashfries, tossed with rosemary, olive oil and garlic. Chris loved the wedge salad, with tomatoes, onion, bacon and blue cheese. We weren’t as crazy about the regular fries and I’d opt for the smashfries, also tossed with rosemary, olive oil and garlic, next time. Even though Smashburger is a national chain, each state has its own menu, using some local ingredients and catering to local tastes. For example, the Atlanta burger has peach BBQ sauce, Wicked Pimina cheese (their version of pimiento cheese), grilled jalapenos and Vidalia coleslaw on an egg bun. Sweet and saucy – just like us Southern belles. Try a Haagan-Daz shake, a soda float or soft drinks, or get a bottle of beer served in an extra frosty mug. I opted for a glass of red wine and got a large portion in a nice sturdy glass that could withstand my knocking it while reaching across the table for another handful of haystack onions. Even though all the burgers are made with 100% Angus beef and placed on an artisan bun, served with real cheese and fresh produce, prices start at less than $5. There are plenty of other reasons to love Smashburger, including the veggie burgers and chicken dishes that are available, the use of recyclable baskets with liners, and the polite servers. As for those milkshakes, I can’t personally vouch for them, but I plan to find out soon. I’ve got my eye on the salted caramel one. Smashburger is at 2625 Piedmont Road. If you’re hankering for noodles, you have to try Genki. This popular noodle house was opened in 1996 by the enthusiastic and charming Reid Zeising. A native of Tokyo, Reid explained his menu as a combination of the Japanese street food and fine dining dishes he loved growing up, as well as some items of his own creation. Really, what’s the point of having your own restaurant if you can’t make up your own roll? The Reid roll is made of spicy chopped salmon wrapped in lettuce and topped with seared Angus filet, avocado and spicy garlic sauce. I’m thinking if I ever got to create my own roll, pimento cheese would definitely be involved. The first time we went I was a bit overwhelmed by the menu at first, as it is rather extensive and then there is the always-fun create-your-own-bowl option. While we pondered, we opted to try one of their delicious drinks to ease the process. The selection of flavored Mojitos, my favorite drink, is extensive. I enjoyed the raspberry Mojito once the waiter ensured the kitchen had fresh mint. I found several things I wanted under the appetizer section alone: calamari, tiger shrimp, shrimp and vegetable tempura, Yokohama lobster and Japanese marinated ribs to name a few. Then there is an entire selection of tuna specialties, soups and salads, traditional bowls and sushi and sashimi. After making our selections we settled back to enjoy our feast. We tried the shrimp tempura. The shrimp was lightly battered and came with more shrimp than we should have eaten, given what was to come. We also tried the Hamachi Kama, marinated and grilled yellowtail cheek, served with ponzu sauce, which we were urged to eat our way all the way through. Then came the towering Tuna Symphony – tuna sashimi, tuna takaki, tuna aioli and tuna tartar, served with house made won ton chips, which rival the spinach for their addictive qualities. At this point the idea of dessert was downright painful, but my husband is never one to turn down anything sweet. So Fried Tempura Oreos it was. But it’s really okay – they are lightly battered before they are fried and served with ice cream and strawberry sauce. Local Three is the kind of place where you feel such a passion for the ingredients and love of all things food and drink that you find yourself scarfing down dishes you’d previously delegated to your never-eat-that list. At least that’s what happened to me during my first visit to Local Three, a collaboration between Muss & Turner owners Todd Mussman and Ryan Turner, and Atlanta chef Chris Hall. My don’t-eat list is extremely short, but pretty much headed by Brussels sprouts, to the point it’s a household joke – my husband being firmly and irrevocably in the pro-sprouts camp. But there I was serving myself multiple portions of the crispy Brussels sprouts, which were unlike any version of the dish I’d ever had. 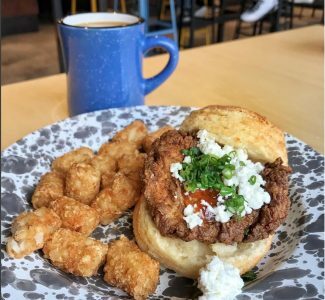 Local Three opened in 2010 and is still drawing more crowds than a Jesus-on-a-biscuit sighting in Alabama. It’s the kind of place that doesn’t take itself too seriously, as evidenced by its motto “You can’t argue with delicious,” the three pig paintings on the wall (one for each owner), and headings on the beer menu like Drink Your Wheaties, Hip Hops Hooray and Identity Crisis. Speaking of drinks, the cocktails here are creatively delicious, with names like The Doctor Told Me to Drink More Water made with Maker’s Mark, housemade ginger ale and lime. The note on the menu reads “By water I mean whiskey and by doctor I mean me.” There’s also the Power Blackout and Six Gummy Bears & Some Scotch. Back to the food. The menu changes daily but you’ll find items like shrimp and avocado toast, North Carolina catfish fingers, panko crusted Atlantic flounder and a charcuterie sampler with accompaniments named The Notorious P.I.G. One day I’ll return just to have the cheese tasting paired with a crisp white wine. The Local Three is at The Piazza at Paces, 3290 Northside Parkway. He’s a two-time James Beard Foundation award winner, Oprah’s former personal chef, TV personality, award-winning cookbook writer and Southern boy from Jasper, Florida. So we were thrilled when Art Smith came to Atlanta and opened Southern Art in the hotel InterContinental where he serves the kind of meal you’d get if the church ladies made their best dishes and served them all at once. The food is so good you’ll be praising the Lord, no matter what your religion. Pork worshippers need to visit the Artisan Ham Bar at Southern Art. Enter through the Bourbon Bar where you may want to stop for a delicious bourbon and ginger beer cocktail, or any of the other 70 bourbons available. There is live music and entertainment every Friday and Saturday. But that’s not the only bar here. Another bar is for all you passionate pork people — an Artisan Ham Bar featuring ham and charcuterie. Our meal started with the ham board, a selection of Southern hams, charcuterie and various pickled items. This is the South and if something stands still long enough, we’ll find a way to pickle it. We also had a big heaping portion of Carolina black rice risotto that the addition of Flat Creek Lodge asiago cheese made extra rich and satisfying. Art told us he had lost 120 pounds (yes, an entire person!) and developed more vegetarian dishes as a result. You’ll find a Southern grain bowl on the menu. By the time dessert came my stomach I was only able to manage a few bites of the 12-layer and bourbon pecan pie. Although it’s in a fancy hotel, prices are fairly reasonable. Validated parked is available in the back lot. As one of the Southern Art staff noted, “Us Atlantans hate to pay for parking.” She got that right. Bocado. Small menu, sparse atmosphere but one of my favorites. The burger is about the best you’ll find anywhere. When it’s nice out sit out on the patio. Figo Pasta. Fresh, inexpensive Italian, with several locations. The pasta is delicious, but for lunch we often take the healthy route and order a salad and the most delicious carrot ginger soup. It’s creamy and divine. Holler & Dash While we may talk all we want about eating healthier, places like this biscuit house still draw long lines. My favorite is the Kickback Chicken with fried chicken, goat cheese, pepper jelly and green onion. A biscuit and tater tots at Holler & Dash. JCT Kitchen. Best fish and chips and fried chicken. Good Southern food done right. We loved this place for years and it has been our choice for company lunches. Sit outside in the courtyard when the weather permits. Murphy’s. Okay so I’m not the most objective – I wrote the cookbook Murphy’s, 30 Years of Recipes and Memories, and we’ve traveled with owners Tom and Susan Murphy – but ask anybody. 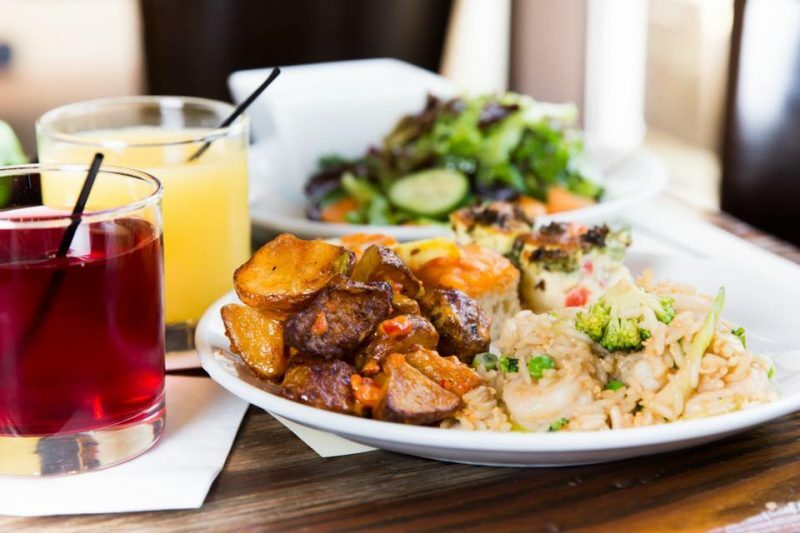 Consistent, delicious food and best brunch in town. Upbeet. Lines are always super long, but oh, these grain bowls are good. I need to switch it up, but am always drawn to the Guac It Out grain bowl. Upbeet also serves salads and smoothies. 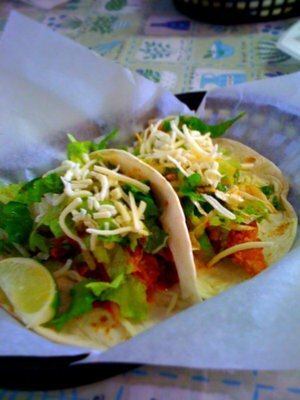 Original El Taco. Best margaritas and chips in town. Food is great too. Like Murphy’s it’s in the Virginia-Highland neighborhood, a bit east of Midtown. Ormsbys. Fun bar food and games – even people who don’t usually go to bars will love it. There are no TVS in here so if you want to watch the big game, go elsewhere. Souper Jenny. Awesome, homemade soups. Lines are long as peak lunch time. I’ve eaten several gallons of My Dad’s Turkey Chili over the years. There are locations in Buckhead at The Atlanta History Center and another on the Westside. Taqueria Del Sol. Cheap Mexican, but you do have to wait in line. The shrimp and corn chowder is always on my order. Atlanta Food Truck Park opened to huge fanfare and lots of press six years ago. We were thrilled for two reasons: 1. It’s right down the street from our home. 2. It replaced a nasty old dump of a hotel. Now that permits for food trucks have changed, it doesn’t seem to be as busy, but still worth a visit. While it may not be an entire neighborhood, our city does have a small area referred to as Little Italy, with every place owned by restaurateur. Giovanni Di Palma. He calls it Little Italia and modeled it after historic towns in Italy. 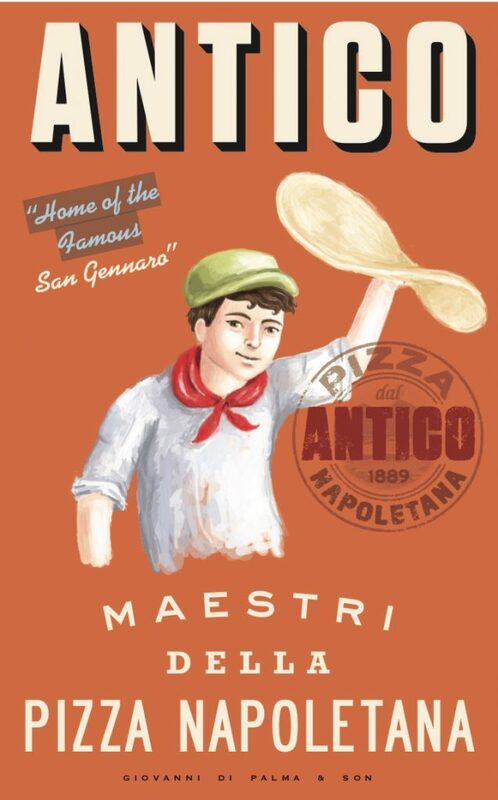 Antico Napoletana Pizza was the first place to open in Atlanta’s Little Italy. Here’s where to get your wood-fired pizzas. Get there before it closes, which is when the dough runs out. Gio’s Chicken Amalfitano is one of our go-tos for takeout. We always get the same thing: Sorrento lemon chicken for me and the Amalfi for my husband, made with olives. The chicken comes with a simple salad of lettuce and parmesan that’s elevated by the quality of the parmesan and the dressing and some potato wedges that I always promptly remove and heat up a bit more as they tend to be undercooked. We occasionally dine in and enjoy the uber casual setting where you grab your own silver off the table and wipe those yummy chicken juices from your face with tear-off brown towels on the table. We take out own wine bottle and find an empty spot on one of the long tables covered in blue-and-white checked tablecloths. When it’s nice, we take a seat outside, conveniently located near Caffe Gelateria, which serves delicious Italian gelato, sorbet, coffees and desserts like marcapones, cheesecakes and tiramisu. Little Italy also includes Bar Amalfi, a limoncello bar that is open seasonally, and the place that started it all, Antico Pizza. This popular pizza place and celebrity favorite serves wood-fired Neapolitan pizzas. Don’t even think about customizations – the menu states no half toppings or substitutions allowed and pizzas come well done and slightly charred. And don’t expect regular hours either. The location in Little Italy is open until it runs out of dough. Antico Pizza also has locations in Avalon and The Battery. Described as contemporary Mexican cuisine, the food at Alma includes such wonders as scallop cruco, pork pibile tamale, seared scallops and snapper Veracruz en Papel? Cocktail choices include Just Wear Black made with tequila, agave syrup and lime juice or Staycation with rum, lime juice and home-made Coca-Cola. One our last visit we tried the Naranjarita with tequila, blood orange infusion and orange brandy. I highly recommend it. I opted for the churros, served with two sauces, and Chris opted for the light yet yummy margarita sorbet. 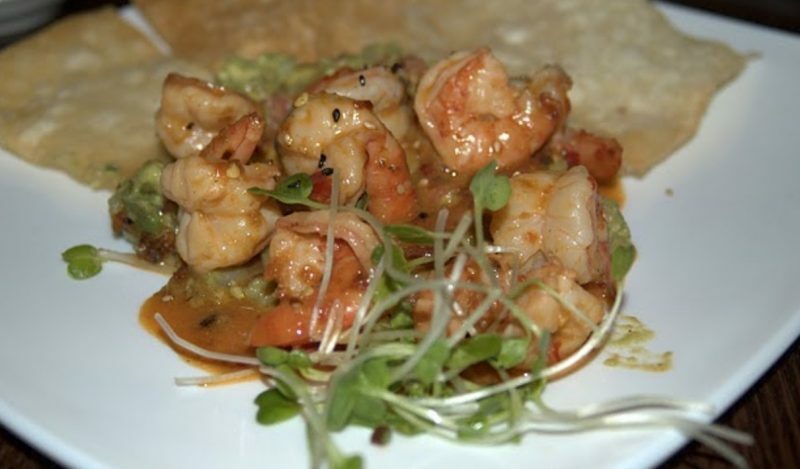 Alma Cocina is part of Fifth Group Restaurants and you can’t go wrong with any of them. 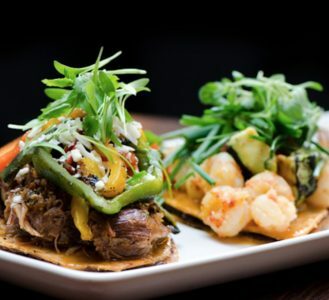 Others include El Taco, Ecco, Lure, La Tavola, and one of my favorites, South City Kitchen, which has four locations and serves contemporary southern cuisine. This is where you want to go for shrimp and grits and fried chicken. 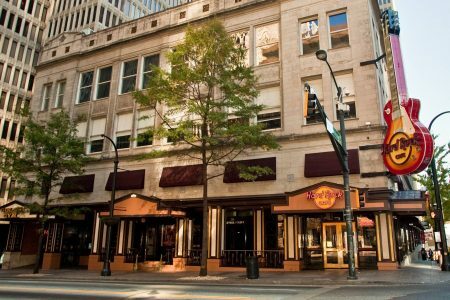 Atlanta’s Hard Rock Café opened in 1992 and while other downtown restaurants have come and gone, it’s still, well rockin’ n rollin’. A few years ago I took my son Christopher, then a college student, to a media event to celebrate new menu items. He had eagerly accepted, sensing the potential for massive amounts of non-college food. It turned out to be a perfect welcome home. He hadn’t really spent much time in a Hard Rock and before heading into the private event space we looked around at some of the memorabilia. He was a heavy metal DJ at Vanderbilt, so he was uber impressed that Neil Murray, the bassist for Black Sabbath, had a guitar on display. I was more interested in Shakira’s tiny denim pants. You always know where you are when you see the giant guitar. Menu items have changed since that event, but still include the half-pound Angus burger available with various toppings. My son’s comment? “The Angus burger is religious,” he declared. Hard Rock also serves sandwiches, salads, hickory-smoked ribs, fajitas and steaks. Desserts include milkshakes, cheesecake, hot fudge brownie and apple cobbler. Fun Fact: In addition to the fact that Hard Rock serves plenty more than burgers, another little known fact is how much philanthropy work the chain does. Hard Rock International sells a line of T-shirts with original musician-created artwork that has raised millions of dollars for several causes. I first went to Nikolai’s Roof a million years ago when my college boyfriend took me there. 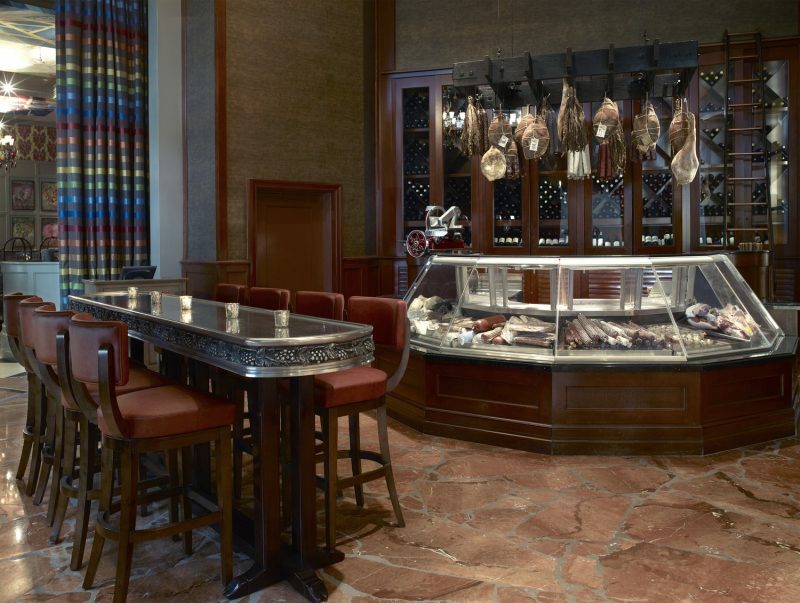 Located at the top of the Hilton Atlanta, Nikolai’s is definitely an impressive place. When I saw a deal pop up for a four-course dinner there, I opted for it for my birthday dinner. And it didn’t disappoint. Check out the three-course menu available for $44 Tuesday to Friday from 5:30 to 6:30. Scott Serpas “encompasses Louisiana roots with Asian and Southwestern accents,” which the menu refers to as true food, a description I can appreciate having tasted what I’ve felt was fairly fake food before. 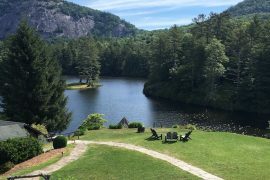 Menu items include eggplant hushpuppies, PBR steamed mussels, crab-stuffed North Georgia trout and maple leaf duck breast. Go on Tuesdays for the weekly Pizza Party. Enjoy a vegetarian or meat lovers pizza and a glass of wine for $20. We now have a new routine for any trips to the airport – make a stop at Grecian Gyro. 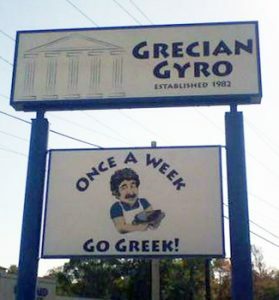 Their motto is “Once a Week Go Greek” and given the magical properties of their secret sauce, we may just find our car steering us down 85 South to Virginia Avenue on a regular basis. Despite its often being made of meats of unknown origins, a good gyro is a mighty fine thing. And I hadn’t been able to find any satisfactory ones in town, despite a rather extensive search my son and I one summer, as he shares my hankerings for the hunks of meat. The best gyros in Atlanta are at a small joint down by the airport. We’ve made out way there many times after returning home. We got that right. Fancy it’s not. But friendly with good food? Oh yeah. On the suggestion of the manager, Chris ordered the Souvlaki plate, made with grilled pork tenderloin. Which gets me to the reason the food at Grecian Gyro is so much better than similar places. The food is made with fresh, high quality ingredients. It can be rare to have pork cooked correctly but his pork tenderloin was so tender and deliciously seasoned. The Greek salad, which we both got on the side, comes with huge chunks of feta, generous slices of tomato and cucumber and a delicious dressing made with excellent olive oil. The Kalamata olives are the real thing – imported from owner Nick Koulouris’s hometown. So let’s talk about that secret sauce. It’s so thick you could turn over a small container and it wouldn’t even run out. Beyond lots of yogurt, dill and garlic I don’t have a clue what makes it so delicious. But we’ll be stopping by to pick up a bottle to take home with us to apply liberally on all future meals. We were almost out the door when the grill operator who had cooked our gyro and souvlaki to perfection, pointed out the spanakopita. “Just get one to go,” she urged. Well, we got it to go but it didn’t go far. It wouldn’t be nearly as good cold, I reasoned. I’ll never get the chance to find out because one of these will never last that long. It was warm, tender, flaky and gone in about 20 seconds. Grecian Gyro has two other locations, in Tucker and Forest Park. Go check it out for yourself. And bring me a bottle of special sauce. How can I not love a restaurant with the name Wahoo in it, as that’s part of my college cheer! Wahoo wah, wahoo wah … But I digress. You can always count on a good meal at Wahoo, which has the best calamari in town. You’ll also find grilled octopus, wild mushroom page, braised short ribs, southern sea scallop and butterscotch pot de crème. I absolutely love butterscotch, but it’s a rarity on Atlanta menus. Simple things done creatively and well. That’s how I’d describe both the food and the décor of Sun in My Belly. This popular catering company also operates a café serving breakfast and lunch. Try Alison’s famous pimento cheese omelette or The Belly Benedict made with honey glazed bacon hash. The lunch menu include dill tuna salad, croquet madame, curried chicken salad and pressed meatloaf.